Here it is - your SPARE 12ft (150") White Screen with Velcro back (exactly like the one that came in the original box) to fit on your 16ft Black Frame Outdoor Inflatable Movie Screen from Holiday Styling. This is your #1 favourite Blow Up Screen loved by all our customers! We have listened and now you have a fresh new white screen as a spare. You can gently hand wash the white screen to use again and again, made from polycotton to stretch out any creases and provide the greatest movie experience. As always, it attaches easily and quickly with strong velcro to fit exactly in the frame it was designed with. That is why Amazon gave us the 'Amazon's Choice' badge. Our screen is easy to inflate in under two minutes and the white screen attaches in no time. Front and rear projection at it's best then power up your projector and speakers and let the fun begin. Perfect INDOORS - just pop your velcro dots on the wall and attach the WHITE SCREEN ONLY TO THE WALL for movie, TV and music video fun or stream your favourite Netflix and Amazon Channels. Give this a try now and see how much fun it really is. 100% satisfaction guaranteed so add this to your cart now and get set for Movie fun this weekend! 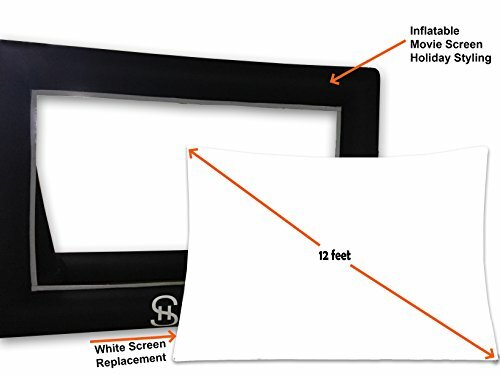 HUGE MOVIE TV CINEMA SCREEN SPARE PART FOR ALL YOUR OUTDOOR FUN - this 12 foot (175 x 125") replacement is perfect attached with the velcro to the huge 16ft black frame or use velcro dots and hang it up inside. Perfect for indoors and outdoors so you can watch movies and TV all day. If you have any questions about this product by Holiday Styling, contact us by completing and submitting the form below. If you are looking for a specif part number, please include it with your message.